When my Lizzie Stuart mysteries were published by Overmountain Press, the authors writing under the imprint, were asked to contribute a recipe to a small collection that could be offered to readers as a giveaway. I had an obvious choice. In Death’s Favorite Child, the first book in my series (being reissued by Speaking Volumes), the victim dies after eating a lethal substitute for the “yummy balls” her aunt made for her. I asked a friend to come up with a recipe (see my website) for the nonexistent snack I had described. But this was not the only appearance of food in that book. Lizzie was on vacation in Cornwall, England. I drew on the research I’d done in London and in the coastal town where a friend and I met for a holiday. In that book, Lizzie shares meals with her best friend, Tess, and the other guests at the private hotel. These are the people who will be among the “the closed circle of suspects” common in whodunits. She also has dinner with Philadelphia homicide detective, John Quinn. Like Lizzie, Quinn is on holiday in Cornwall. Like Lizzie, he is drawn into the murder investigation. 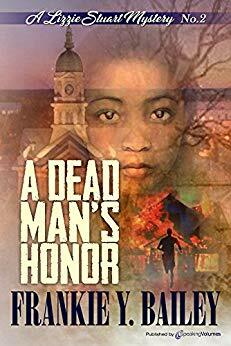 In A Dead Man’s Honor, Lizzie has moved to Gallagher, Virginia, the fictional city that will become her home base. In this book, I introduce readers to “Miss Alice,” a woman who knew Lizzie’s grandmother when they were both children. Miss Alice continues to reign over the Orleans Café. As a crime historian, Lizzie spends time in libraries reading old newspapers and going through archival collections looks for clues. But she also knows the value of oral history interviews. Miss Alice is her source when she has a question that she is not able to answer or when she needs more context (See recipes from the Orleans Café on my website). In A Dead Man’s Honor, there are other characters with whom Lizzie shares intriguing conversations during meals -- including the soon-to-be victim and John Quinn. It is giving nothing away to say that as the series has evolved, Lizzie and Quinn have gotten to know each –and shared both romantic moments and conversations about murder as they ate. In Book Six, they will be in Santa Fe for Thanksgiving dinner before coming home to Gallagher. Frankie Y. Bailey is a professor in the School of Criminal Justice at the University at Albany (SUNY). Her areas of research are crime history, and crime and mass media/popular culture and material culture. 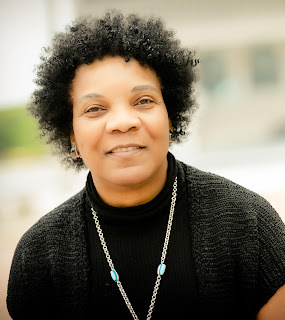 She is the author of a number of non-fiction books, including local histories and books about crime fiction. 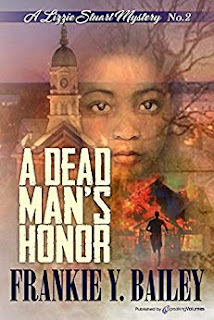 Her mystery novels feature Southern-born crime historian, Lizzie Stuart, in five books, beginning with Death’s Favorite Child and A Dead Man’s Honor. The books are being reissued by Speaking Volumes. Frankie’s two near-future police procedurals feature Albany police detective, Hannah McCabe in The Red Queen Dies and What the Fly Saw (Minotaur Books). Frankie has also has written several short stories, including “In Her Fashion” (EQMM, July 2014), “The Singapore Sling Affair” (EQMM, Nov/Dec 2017), and “The Birth of the Bronze Buckaroo” (The Adventures of the Bronze Buckaroo, 2018). She is currently working on a nonfiction book about dress and appearance in American crime and justice, a historical thriller set in 1939, and the plots of the next Stuart and McCabe books. Frankie is a past executive vice president of Mystery Writers of America and a past president of Sisters in Crime.